Little Nan's Bar - the cocktail bar where you drink cocktails from teapots and all sorts of strange things happen - is opening at the Red Gallery in Shoreditch as a ten week pop-up with a 90s theme. Open Tuesday - Saturday evenings, a 2 hour slot costs from £10, and for that you get 90's Tunes, Unlimited Pic n Mix, Fairground Pop Corn, Spice Girls Vs East 17 Photo Booth, Bottomless Teapot Cocktails and lots more. Get dressed up and go! 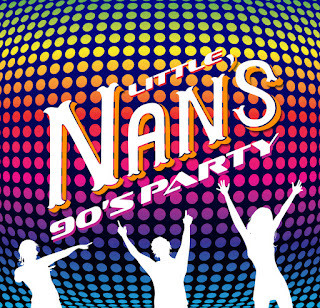 "The Multi Award Winning Little Nan’s Bar is back in Shoreditch for a 10 week pop up from 25th Feb - 1st May! This time they have transformed their favourite London creative space, the unique Red Gallery on Rivington Street into a Kitsch Haven where guests can book in for 2 hours of Bottomless Teapot Cocktails, unlimited 90’s pic n mix and fairground popcorn, all to the sounds and visual treasures of the 90’s! Little Nan has gone on her yearly spring break to Benidorm and left the Grandchildren in charge! The’ve only gone and moved into the Red Gallery and filled it full of Little Nan’s antique furniture, teapots and 90’s treasures found in their very own attics! Everyone loved Mark Owen, TLC, Spice Girls, Eminem, Sabrina the teenage witch… right? Let Grandson Tristan know if its your Birthday, Hen party, Baby Shower, Leaving Do or Engagement celebration on booking your visit and his Nan will name a special bespoke cocktail in your honour using all your favourite flavours and spirits. She will also name a cocktail after your hot date if you want to make that extra special impression… Psyche! Little Nan’s 90’s Party is open every Tuesday - Saturday 5pm - 12.30am till 30th April with 2 hour sittings starting every hour. Also available for private hires! Little Mum invites you round for her popular Cocktail Afternoon Tea Parties on Saturdays! Along with an extensive cocktail menu there will also be a selection of Beers & Cider available, plus fresh Popcorn and savoury snacks are included in the unlimited pic n mix stand. Some of Little Nan's tables are communal so smaller groups maybe seated with another group. Friends are made whilst round Little Nan’s!"